Calligraphy Supplies I Love (and you will, too)! With a huge variety of calligraphy supplies out there – nibs, inks, pens, papers, etc. – I think it can often get overwhelming when making your purchases. While many supplies are based on personal preference, other supplies I believe are a bit more quality than others. I wanted to share with you some of my favorites and give you some tips on where to purchase them! Dr. Martin’s Pen White & Copperplate Gold – two great inks for those special white and gold requests. You’ll want to water down the pen white before use, but I love it because it doesn’t bleed. The Copperplate Gold can be found at Hobby Lobby or other craft stores. FW – a great acrylic ink for colored jobs. Drying time is a bit longer than most other inks. 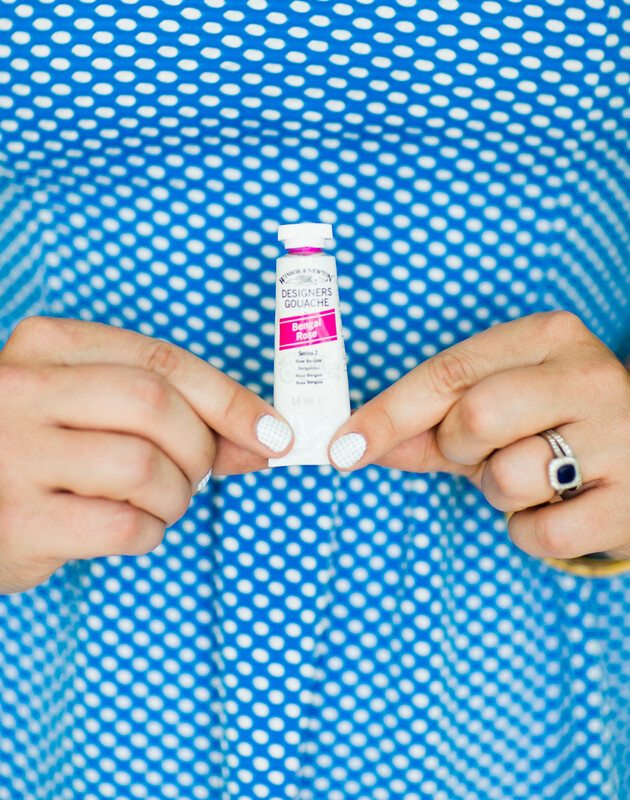 Winsor & Newton – This gouache has been the most quality and easiest to work with. Purchasing Series 1 is just fine, especially for beginners. You’ll mix this with water until you get the color and consistency you desire. Just love this medium. (Excellent for white and gold, as well). The pen I use for every job is an oblique pen – in fact, I use just a really cheap-y pen. I find I like them and I have so many laying around I never misplace it! People often ask why I use an oblique pen – it’s because it’s what I know! I learned on an oblique pen (used for a traditional script) and have gotten so used to holding it I continue to use it. My hands-down, absolute favorite nib is the Zebra G nib. You can buy them individually at Paper & Ink Arts or in packs of 10 at Jetpens.com. (They offer free shipping on orders of $25, as well). For practicing, warming up, or lettering jobs, marker paper is just great. Try one like this. Lastly, I couldn’t do most of my jobs without my light box. This 9 x 12 box is the current box I use and I love love love it. SO glad you compiled all of this into a post! It’s so helpful!! Thanks for the recommendations! I’m left-handed and just realized they sell special lefty nibs (who knew!?). I’m wondering if you have a rec between the Brause, Mitchell or Speedball nibs as those are the LF options. Thanks in advance, love your work! Hi! Out of those nibs, I’d recommend a Brause because I don’t love the Speedball nibs and I’ve never tried a Mitchell! 🙂 Thanks! Would you recommend the LIQUID gold Winsor&Newton gouache at all or just the Series 3 Gold? Just discovered your blog and so excited to see you teach classes in the DFW area!! Hoping to get my hubs to sign me up for one as a Christmas present! Pingback: Hello. I’m a Calligraphist. « Hello. I'm a Paper Addict. Hi! Love your blog and your instagram feed! Please come to the Bay Area and teach a class soon. Could you also tell me where to find those little jars that you use to mix your gouache ink? I find so many have mouths that seem too narrow. Thanks! I noticed in a lot of your images there are pots that sit in a roll of tape. I was wondering where you get your pots to put paint in and tape.. and if the tape is used for something more than just to help hold your pots in place?